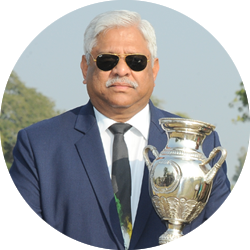 Lt Gen Surendra Kulkarni is an Old Boy of Mayo College. He joined in 1964 and completed his MSc in March 1970. He has served in the Army for nearly four decades. He was commissioned into the Armoured Corps in 1975. In his long and distinguished career, he has commanded the largest forces and held some of the most prestigious assignments. In recognition of his special contribution, he has been awarded a Vishisht Seva Medal twice, an Ati Vishishta Seva Medal and finally the highest peacetime distinguished service award in the Armed Forces, the Param Vishisht Seva Medal by the President of India. Parallel to his Army career, he has pursued his academic interests. He is an economics graduate from Fergusson College Pune. He was a post graduate UGC Merit scholar before he joined the Army. He has four Masters Degrees including an M Phil degree. He would be one of the few officers to have been sent abroad thrice on academic assignments. He has taught at the Armoured Corps Centre and School, Ahmadnagar, Institute of Armament Technology, Pune and the Defence Services Staff College, Wellington. In Mayo, he was in Colvin and Rajasthan Houses. He was a keen sportsman, who played Cricket, Tennis, Squash, Football and Hockey.